Come lay down flat to 190 degrees and enjoy the amiable massage to escape that stressful world. brings you true relaxation from your head to your toes. It's ergonomic chair back design and humanized built-in programs performs hand touch rolling, tapping and kneading functions. Come lay down flat to 190 degrees and enjoy the amiable massage to escape that stressful world. 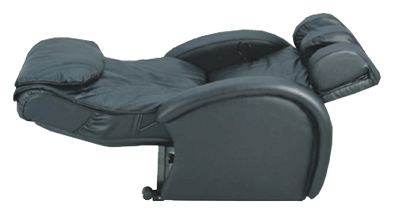 Inversion reclining: It reclines up to 190 degrees to relief spine pressure and also enforce neck and shoulder massage. It evenly spreads the body weight over the whole back, which is the most relaxing posture to enjoy the whole body massage. makes it easy to get in and out of the chair. chair back design brings human touch massage to you. customizes the massage for you. massages calves and feet by kneading and rolling. helps the lower body relaxation. gives the sore spot a nice treatment. makes it a regular recliner. Tapping massage helps to improve blood circulation, reducing muscle stiffness and enhancing movement of oxygen and nutrients throughout the body. Advanced Massagenius technologies present in all of our massage chairs enable you to select the strength of the 500 taps per minute as well as the area to be massaged. The most unique function of this chair is it let you have total control of 12 roller moving speeds and 12 different levels of intensity. In the manual mode, it will work in the specific range you designate at the speed you command with the intensity you like. It works better than a skilled massage expert, like an amiable servant, it is always at your service.